by Greater Media in Charlotte, NC to send to the state. Top on-air talent Bo Thompson from WBT and Sheri Lynch from WLNK's "Bob & Sheri Show", delivered the water by caravan. 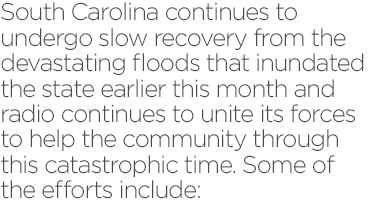 and donated to flood victims through a radiothon/ telethon partnership between Alpha Media Radio Stations and NBC Affiliate, WIS-TV in Columbia, SC. food and water was collected by a "Float for Hope" sponsored by Summit Media in Greenville, SC. It was delivered to the Harvest Hope Food Bank, who indicated it was the largest drive in the upstate region for victims of the flood.